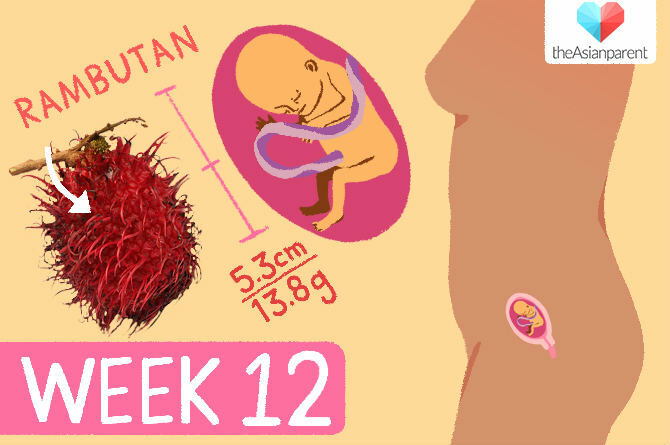 Welcome to the last week of the first trimester! You’ll be glad to know that after the 12th week, the chances of a miscarriage drop significantly. Joy! And, if you’re expecting twins, your little bump will be showing too. Your baby is preparing for yet another rapid growth phase focusing on organs and tissues. At 12 weeks he is beginning to develop reflexes. He now flexes his tiny toes and hands, which may look like he’s waving back at you during ultrasounds! He can now curl his fingers and toes and even open and close his tiny hands. His tastebuds are quickly maturing. His fingernails and toenails start forming. Hormones may also cause your skin to breakout or itch, leaving you insecure. Fret not, off-the-shelf options such as calamine lotion can help zap them. For more severe cases, seek treatment from your gynaecologist. The “mask of pregnancy” or chloasma (also referred to as melasma) may be slowly creeping up on you. Your stomach muscles are becoming less active, causing harder stools and making you release more gas than usual. Drink more fluids and eat more fruits to promote bowel movement and prevent the dreaded constipation. Thanks to the growing bump, your stomach might start to feel a little stretched, and, well, some clothes might feel a little tighter around the waist. Breathe easier by donning comfortable clothes. Now for some good news in this week by week pregnancy guide: you may start to glow, and that’s a happy thing! Shine on, mama! If you are one of the lucky few with nary a loss of appetite or nausea, you are indeed fortunate! In this week by week pregnancy guide, know that weight gain during the first trimester should be slow and steady, but if you’ve been overindulging, do take heed on the recommended weight gain by your gynaecologist. If you have been losing your appetite and been constantly tired, it’s common to lose weight or gain minimally. By the end of the first trimester, once all these symptoms clear, you’re well on your way to the honeymoon period of your pregnancy. As your uterus expands, you may occasionally experience mild cramps when there’s sudden change in movement e.g. coughing or moving from lying to sitting position. Muscle cramps are normal but do take note if the cramps are severe and prolonged causing major discomfort. Your breasts may be screaming for space at this point. It’s time to get fitted with comfortable support bras to tide you over the next few months (until you get bigger). Head to the lingerie department to get measured. If you have been living in pants, jeans, and shorts, it’s about time to get maternity clothes and nursing bra that can accommodate your growing belly. Make sure they are comfortable enough to accommodate movements such as sitting especially around the hips and thigh areas. You may want to start hunting for a confinement nanny as early as now to give an allowance for the actual search and hiring process.